Sorry, Bambi!. "Sorry, Bambi!" 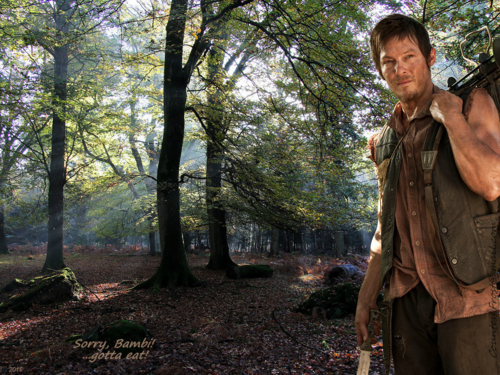 वॉलपेपर created द्वारा TheCountess features Norman Reedus as Daryl from the TV series 'The Walking Dead'. 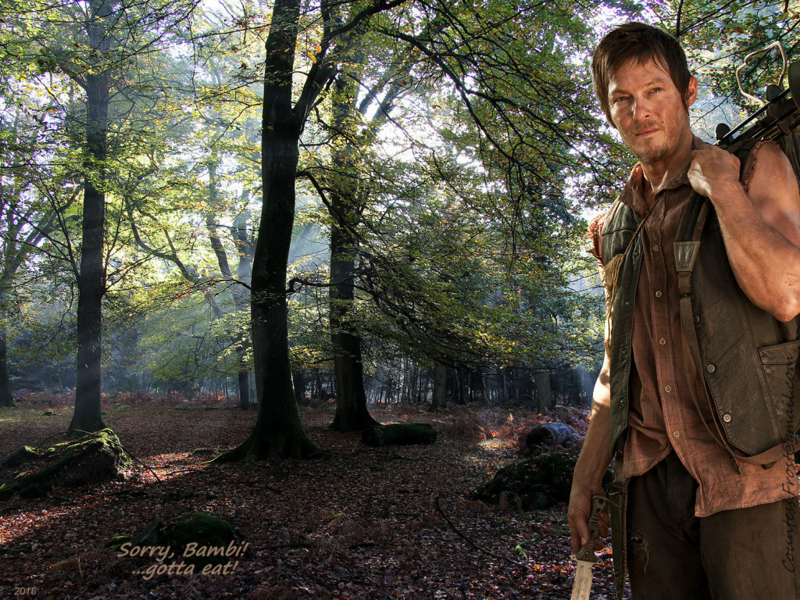 Note: no deer were hurt during the creation of this wallpaper.. HD Wallpaper and background images in the द वॉकिंग डेड club tagged: the walking dead twd tv series daryl dixon norman reedus crossbow hunting knife fan art wallpaper thecountess. This द वॉकिंग डेड wallpaper contains पुरान बलूत, लाइव ओक, live oak, बीच, बीच पेड़, बीच के पेड़, महोगनी, महोगनी वृक्ष, and महोगनी पेड़. There might also be sitka सजाना, picea sitchensis, सिटका स्प्रूस, पिका सिटचेंसिस, ग्रीन टोपी, विशेष बलों, कुलीन सैनिक, हरे भरे, विशेष बल, हरी टोपी, अभिजात वर्ग सैनिक, अमेरिकी सफेद सन्टी, कागज सन्टी, paperbark सन्टी, डोंगी सन्टी, betula cordifolia, betula papyrifera, अमेरिकन व्हाइट बर्च, पेपर बर्च, पेपरबर्क बिर्च, डोंगी बर्च, बीटाला कॉर्डिफ़ोलिया, and बीटाला पैपरिफेरा.